This soup is inspired by my trip to the farmers market, as most of my recipes are. I was drawn to the Castelfranco Radicchio, a sweet Italian chicory, that is a creamy green with gorgeous pink spots and stripes. Drawn to soft colours, I picked out pale yellow carrots and pastel pink and grey oyster mushrooms. I love finding exquisite variations of common produce in order to make a dish feel a little more special. However, feel free to use conventional carrots and oyster mushrooms, if that’s more convenient for you. 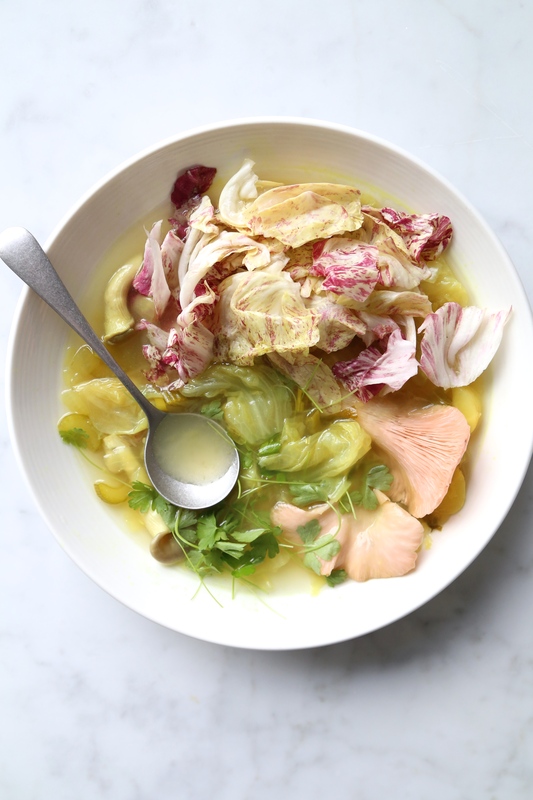 In place of castelfranco radicchio, you may use Belgian endive or conventional radicchio. Heat olive olive in a large pan over medium heat. Sauté the onion, carrots, celery, garlic, ginger, lemongrass, and turmeric until vegetables are softened, about 5 minutes. Add 7 cups of water and bring to a boil. Reduce heat and simmer for 20 minutes. Add the cabbage and mushrooms, sea salt, and coconut sugar and simmer for an additional 5 minutes. Season as necessary. Remove soup from heat and add lime juice. Serve with torn chicory, and herbs. This entry was posted in Soups and tagged Autumn, chicory, fall, lemongrass, one-pot, radicchio, soup, South East Asian. Bookmark the permalink. This looks great! I’ve never used lemongrass but will have to find it in my local store. Have you ever made zoodles? I’m curious as to how you’d style them. I recently had zucchini noodles in a soup and they were delicious! I would use 2-3 zucchini’s in this recipe and add them with the cabbage.